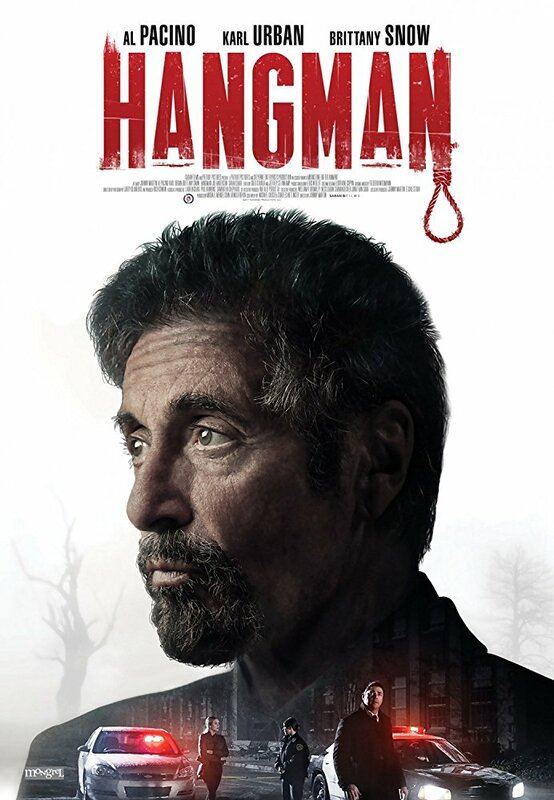 Grieving NYPD detective Karl Urban teams up with retired, Latin crossword-solving homicide veteran Al Pacino to catch the psychopathic mastermind “playing a game” of hangman around the city, creatively posing his victims and carving a specific letter on each body. Punctuated by chase scenes on foot and on the road, this throwback to 1990’s serial killer movies has a very familiar SE7EN-style evil puppet-master (Joe Anderson) engineering an elaborate series of crimes and clues while staying at least one step ahead of the cops. With no surprises or shocks, it is almost nostalgically generic, with everything tailored to formula, from Urban’s dead-wife back story to Brittainy Snow’s underwritten NY Times reporter, a vapid figure who exists just to be captured and threatened in the final act (during a thunderstorm, to boot). Urban is wooden, while Pacino’s effortless charisma distracts us from the fact that he probably came out of the womb able to play this kind of role, interchangeable with any number of cop characters he has played in latter-day movies unworthy of his presence. Inoffensive but totally forgettable.